I so enjoyed the last book in this short series that I decided to pick up all of the currently published titles. I’ll review each of them as time goes on. This time around, I will discuss The Manga Guide to Statistics. Ahh, statistics. The subject that so many of us need to understand, too few grasp, and even fewer seem to enjoy. What better way is there to test the quality of the book than for me to read about something I don’t particularly enjoy and have never been terribly good with? The book is designed to give an elementary understanding of basic statistical concepts and methods in a creative and approachable manner. I’ll skip to the bottom line and say that I think it succeeds in doing so. The art is very well done, the story line is a bit better than in the Electricity book I reviewed previously, although it bogs down near the end, and the information is presented in a clear and logical manner. 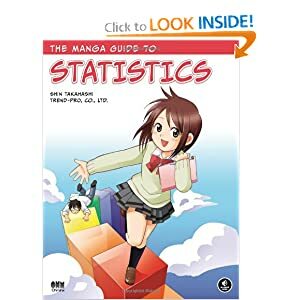 The Manga Guide to Statistics begins by defining various data types and how to determine in which category the data you have belong. Then it digs deeper into understanding numerical (quantitative) data and categorical (qualitative) data. Later, you are guided through normalization, scoring, deviations, probability, relationships between variables, and testing hypotheses. All the standard foundational aspects of statistics are covered in enough depth to give a valid and useful introduction. One thing I really liked was the appendix, which shows very clearly how to do all of the major calculations using Microsoft Excel, with xls spreadsheets available for download from the publisher’s website. While it would certainly be my preference to not have this topic tied to a specific program from one vendor, I did test out many of the spreadsheets and instructions using OpenOffice.org‘s Calc spreadsheet. Good news! With the exception of menu locations for functions being different and requiring a little bit of not-too-difficult searching, I was able to follow all of the directions I attempted from the appendix using OpenOffice.org Calc. That freed me from an expensive and unnecessary expenditure (or at least from having to find a place and way to use software I don’t want to use). If you already know statistics pretty well, this book wouldn’t be useful to you. If you are looking for an easy to understand and quality introduction that includes a bit of frivolity, you will find this book both useful and enjoyable. I did. If I had this when I had to take the stats course for my Computing Science degree, I would say I could retain more information off the Manga’s guide than the horribly dry textbook that i had to deal with. Definitely. Hey, I have another one in the series sitting on my desk, The Manga Guide to Databases. As soon as I have time to read it, I’ll review it as well. If it is as good as this one and the electronics book, CS people will probably be interested in it, too.